Commercial rope access work has changed dramatically over the past 20 years as it’s evolved from a bunch of daredevil abseilers on oil rigs to today’s multi-purpose, multi-billion dollar maintenance industry, based on highly-trained and accredited rope access technicians. Not surprisingly, the equipment has changed with it. In my 10 years + working on the ropes in Sydney, I’ve had a chance to see the advances close up, to test the manufacturers’ claims and, ultimately, to decide what equipment works best in terms of function and safety for my team. The following are my all-star nominations, whether you’re looking at high rise window cleaning, building maintenance, concrete cancer repairs, high safety systems – or anything in between. And if you’re wondering why there are so many Petzl (https://www.petzl.com/INT/en) products on the list, it’s not because of any connection I might have with the French company, despite being well connected by the company! Like Prorax, they just happen to be very good at what they do. As a wise man once said, it all starts with the rope. After many years of trial and (thankfully very little) error, I’ve settled on Edelrid’s 11mm Safety Super Static II (see https://www.edelrid.de/en/work-safety/static-ropes/safety-super-ii-11-mm.html). The 150-year-old German manufacturer describes this rope as the workhorse in the Edelrid stable, and its combination of durability, lightness and smooth flow has certainly made it my go-to rope. No, it’s not cheap – I spend more than $1000 on 200 metres (the maximum length) for my 2 x 100-metre twin-rope set-ups – but it’s a price I’m more than willing to pay for confidence and utility. It makes sense that when you’re looking for the best descenders and ascenders (see below), you go to a company founded by a world-renowned caver. French company Petzl’s Rig descender (see https://www.petzl.com/INT/en/Professional/Descenders/RIG#.WWWOw4VOKP8) is light, compact and beautifully-engineered so that the rope feed, braking, descent speed and clip-on functions are easy to use or automatic. I should also say that it’s a split hair between the Rig and the Petzl I’D descender (see https://www.petzl.com/INT/en/Professional/Descenders/I-D-S#.WWWRTIVOKP8). Comfortable, simple to use and with an integrated safety catch, the Petzl Ascension (see https://www.petzl.com/INT/en/Professional/Rope-clamps/ASCENSION#.WWWcf4VOKP8) makes the business of going up that much easier. Not so long ago, all rope access fall arrest safety gear came as two separate pieces (Petzl Shunt, old ASAP and all other brands) where you had to separate carabiner with the shock absorber and fall arrest so you end up with a free falling piece in your hand (ASAP) to attach to the rope. What that meant when you were up on a job was one more thing that could go wrong (to drop the fall arrest to the ground) if you weren’t careful, putting people and property below in danger. Then the New Petzl ASAP-LOCK (see https://www.petzl.com/INT/en/Professional/Mobile-fall-arresters/ASAP-LOCK ) came onto the market in 2015, and now the shock absorber is always attached to your harness. And as you’d hope, it’s totally hands-free, with any sudden fall triggering the ASAP’s automatic lock. Well done Petzl. Made in the UK, the Hydrajaws Model 2000 Medium Duty Tester (see http://www.hydrajaws.co.uk/products/model-2000) is easy to use, compact, comes with adjustable footings and, in the best British tradition, is built to last forever. Sold here as the MK11 export model, it also has the advantage of coming in a great carry case. And who doesn’t like great carry cases? This is a tricky one, because we all have different body types and, as a result, harnesses are often a very personal choice. 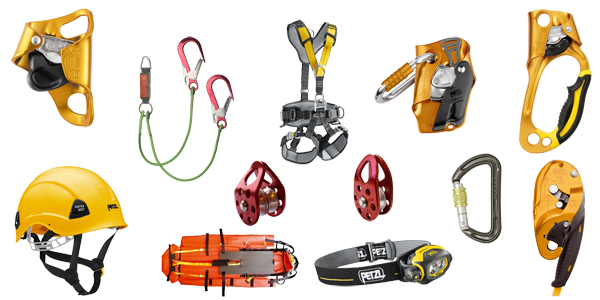 For mine, though, you can’t go past the Petzl AVAO Bod Croll Fast (see https://www.petzl.com/INT/en/Professional/Harnesses/AVAO-BOD-CROLL-FAST-international-version#.WWWsE4VOKP8), which integrates the company’s superb Croll rope clamp, adjusts easily and even has a fall indicator that tells you when the harness needs to be replaced. Before seats came into vogue, there was always the danger that hanging on the ropes for more than 20 minutes could cut your circulation off – with serious consequences. For a time, the industry had to rely on its own inventiveness: one guy I worked with made a seat out of a skateboard. Now, with the lightweight Petzl Podium (see https://www.petzl.com/INT/en/Professional/Harnesses/PODIUM#.WWWiCYVOKP8), you can dangle all day in comfort, and even keep it on you as you move around thanks to its harness attachment design. It might not immediately qualify as a life-and-death decision, but a good rope bag means one less distraction to take your focus off the job at hand. The 145-litre Black Diamond Zion Haulbag (see https://blackdiamondequipment.com/en/big-wall-climbing/zion-haul-bag-BD8102800000ALL1.html) is comfortable to wear, has plenty of space and is solid enough to stand upright on its own, a real plus when your packing/unpacking it. As the company says, it’s one big pig! So there you have it, my eight, indispensable pieces of equipment for professional rope access services.